Having sat through too many dull as dishwater PowerPoint presentations and software demos, I found the following presentation fascinating. Its by Dr John Medina, the author of Brain Rules: 12 Principles for Surviving and Thriving at Work, Home and School. Meetings - An Excuse to waste time? Meetings either seem to go very well or are a complete waste of time. 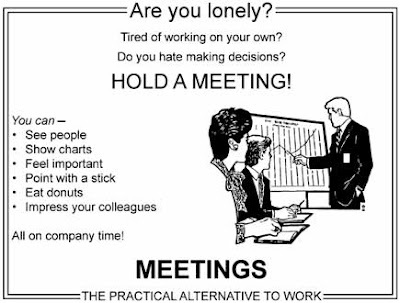 Seth Godin posted this image to his blog which sums up what a lot of people think about meetings. Those of us in the mid 30's age range can probably recall with fond memories, the Tom Baker years of Dr Who. While they will always be those who claim that Pertwee, Davidson or even David Tennant is the best, Tom Baker for most of us is the best Dr.
Part of the charm, was the ridiculous long scarf that he wore at all time and which seemed to serve no purpose. According to Lucy Mangan in Thursdays Guardian, there is a whole new sub culture around Dr Who and knitting. Its all come to light after the BBC threaten to sue a knitter who was giving awayknitting patterns for the Ood and Adipose aliens. While she was charging for them, someone else was selling them on Ebay and the poor old BBC felt threatened. Our organic box delivery has landed us with a surplus of carrots recently, so I decided to convert most of them into a soup. The soups inspiration came from A Celebration of Soup and make 8 portions. If you want to make the soup in advance, add the orange juice just before you serve the soup.